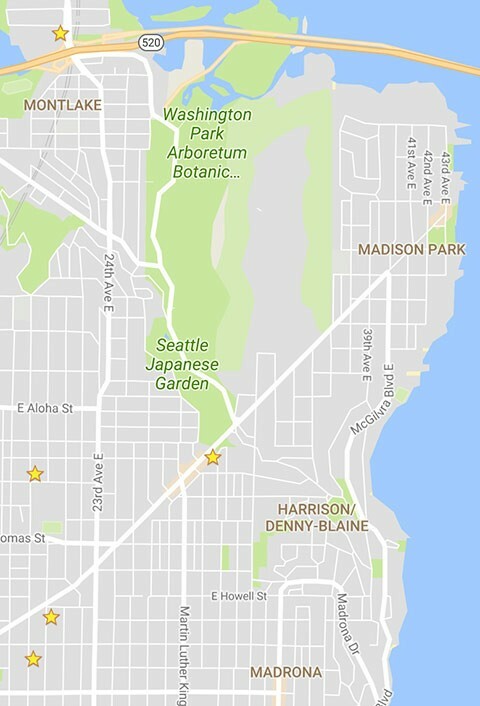 Here are the Seattle OPCD and SDCI Land Use notices and City planning activities in the last month for communities from 18th Ave. to Lake Washington and E Union St. to SR-520. The Seattle City Council is considering proposed legislation to Seattle’s land use code to modify the design review process. The legislation would change many aspects of the design review program, as described in the linked notice. The City Council’s Planning, Land Use and Zoning (PLUZ) Committee will hold a public hearing to take comments on the proposed changes to the design review program. Monday, September 11, 2017, at 7:00 p.m.
September 13, 2017, at 6:30 p.m. The Washington State Department of Transportation has requested a Major Public Project Construction Variance from the maximum permissible sound level requirements of the Noise Control Code, Seattle Municipal Code, during construction of Mountlake Phase of the State Route 520 Bridge Replacement. Work will include construction of the West Approach Bridge South, Montlake lid and interchange, and a bicycle/pedestrian land bridge over the highway. This variance application pertains to the above-ground construction activities that need to take place during nighttime hours. Land Use Application to subdivide one development site into two unit lots. This subdivision of property is only for the purpose of allowing sale or lease of the unit lots. Development standards will be applied to the original parcel and not to each of the new unit lots. Zone: Lowrise-1, Arterial within 100 ft.